Oregon’s offense is stagnant. Constant complaint from fans and poor performances against below-average defenses make it abundantly clear that there are some serious flaws. Article after article details the issues that the Ducks have with play-calling and running the ball inside even when there are nine defenders in the box. But this is not why Oregon’s offense is stagnant. The culprit is a player, and one you’d least expect. A potential top ten draft pick. 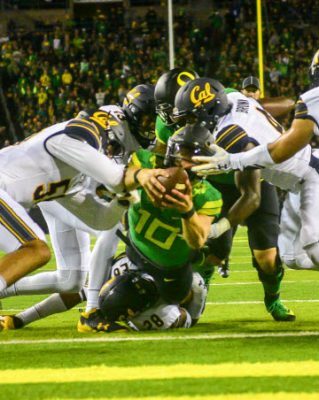 The man to blame is Justin Herbert, the quarterback with tunnel vision. Herbert only likes one of his receivers! Thirty-two percent of the passes completed by Herbert in the 2018 season have landed in the hands of Dillon Mitchell. That is 56 of 173 completions. Mitchell has also accounted for 35% of the yards Herbert has thrown for, or 833 of Herbert’s 2333 passing yards. Maybe other receivers CAN catch the ball. Compare Mitchell’s statistics to any other receiver on the roster, and it is distressing how far ahead of everyone else he is. No other player has even half of the number of receptions or yards that Mitchell accounts for. How is a receiver having a great season a bad thing for the offense? If you go back and really watch the footage it becomes clear that there is an issue here. He flat out ignores Brendan Schooler when he is open downfield. He overthrows guys on the sidelines three or four times a game. And, far too often to win many tight games, he makes one read (Mitchell) before throwing the ball away. This results in double coverage on Mitchell, forcing Herbert to try to throw his guy open every time. It also results in the defense having little trouble on passing downs, because everybody knows where the QB is going to throw the ball. It’s no surprise that Herbert is completing less than 60% of his passes this year. It isn’t just the unwillingness to spread the ball around that is hurting the offense this year. In 2018, Herbert would rather throw the ball out of bounds than to run the ball for five or six yards, which often leads to long yards-to-go situations and more predictable play calling to make up the yardage. Did Herbert’s injury make him afraid to run the ball? Herbert has 150 yards rushing and two touchdowns in 2018. He is averaging a paltry 2.9 yards per rush. 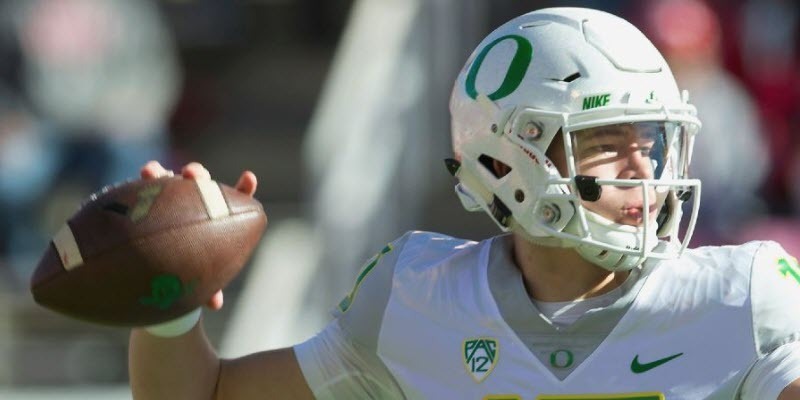 Conservative running by the quarterback has removed a dangerous element from the Oregon offense. The Texas A&M Aggies are very similar to the Oregon Ducks as a team this year. They are moving from a spread out speedy offense to a more pro-style offense. They have talented-but-not-elite defenses, and new head coaches. However, there is a major difference. Texas A&M has the 25th ranked offense, while Oregon only has the 39th ranked offense. What are some things that Texas A&M is doing that the Duck’s aren’t? Kellen Mond knows how to spread the ball around. The Aggies have six players with more than 200 yards receiving, while the Ducks have a meager three. Don’t be fooled by the fact that Herbert has about 80 more yards passing than Kellen Mond. The passing touchdowns between the two aren’t comparable due to Texas A&M being more focused on the running game to finish drives. Mond also has 100 more yards rushing than Herbert, highlighting the fact that only a few more yards rushing by the quarterback can result in a 14-spot better offense. 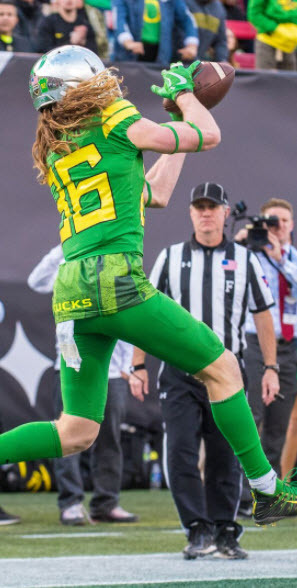 Essentially the Ducks have a quarterback who has faith in only one of his receivers, and who refuses to use his legs to make the offense less predictable. 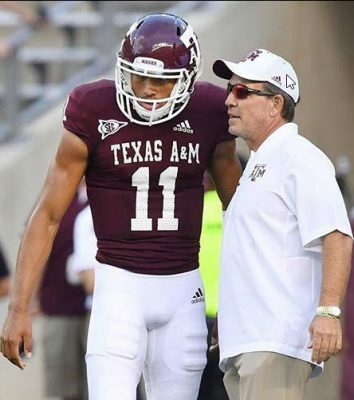 A quarterback with loads of talent, and the ability as both a passer and a runner to change the course of any game, but who does not capitalize on his ability to help a stagnant offense. Ultimately this has led to Oregon’s points per game dropping from 49 in games that Herbert started in 2017 to a modest 36 in 2018. The fans want to blame the offensive coaching staff, and they are certainly worthy of blame, but at the end of the day the players need to start making plays, and one player in particular needs to spearhead the effort to right the ship. Let’s hope that the coaching staff can find a prescription that will help Justin Herbert fix his tunnel vision. Are you an occasional reader referred by Bleacher Report? Put us on your bookmarks/favorites and check us often as we will have an article six days a week about Oregon football and upcoming–Oregon Basketball! And we do invite you to read the comments below of which are just amazing from the erudite readership we are fortunate to have for this free, All-Volunteer site.